I was excited to see the opening week of Troll Hunt, on exhibit through summer 2019. Journey through [the Arboretum’s] far-reaching forest to hunt for six colossal trolls crafted from reclaimed wood by Danish artist Thomas Dambo. Marvel at these 15- to 20-foot-tall (and one 50-foot long) sculptures that have been created to serve as protectors of our environment. The trolls are designed to be interactive, and it’s such fun to come upon each one and the little scenario it inhabits. Emmett went three times this weekend with my mom, who volunteered 300 hours at the Arb last year! Emmett gave each of them names “Trapper,” “Sleeper,” “Crusher,” etc. and drew a really fun portrait of his favorite guy. If you’re in the area, check it out! Troll hunt is included in general admission. With another chilly, gloomy weather week ahead, I’m daydreaming about spring and summer. Despite the snow in the forecast, I switched my closet over to my spring wardrobe and already know that my weekend go-to is going to be this awesome 515 hat by (code)word. I picked it up at a fun pop up shop night for give. at The Mansion on Ingersoll a few months ago. The coolest part about the hat – aside from repping the DSM area code, of course – is that a portion of the proceeds benefit Blank Children’s hospital. I have had so many people ask where I got my hat that I reached out to the team at (code)word and we’re doing a giveaway! Check out their site because they have hats for a bunch of states. Comment below with something on your spring/summer adventure list. I’ll pick a winner at random on April 15. 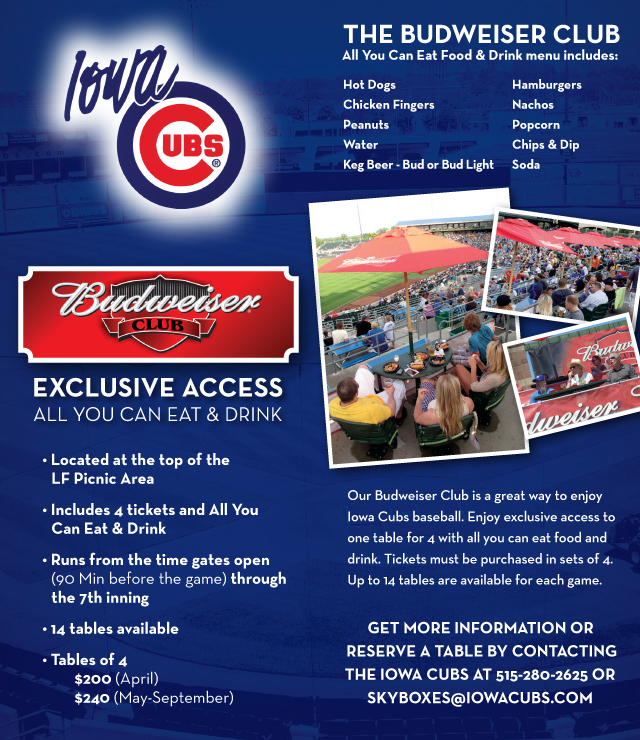 Joe and I have reservations for one of the Iowa Cubs Bud Club all-you-can-eat-and-drink tables this spring. I’m typically a GA 3rd base line/supervise kids playing in the outfield fountain kind of girl, so that should be interesting! PepperHarrow Farm in Madison County has the loveliest Instagram account and I’d love to stop simply stalking it and attend one of their events or a floral design class that they host. The best summer days involve some time on my bike, and I’ve never taken the Summerset Trail to Summerset Winery. I used to love biking the Katy Trail from Columbia, MO to the winery in Rocheport. We finally booked our flight to London/Scotland for August (and we’re going without kids!) and I’m poring over travel guides but would love your suggestions. I studied abroad in London but it’s been more than 10 years since I was there. Don’t forget to tell me about you summer adventures to enter the (code)word hat giveaway. Thanks, (code)word! Disclosure – I’m not being compensated for this post. I just really like my hat and wanted to spread the love. Well, that went fast. I’ve been in my new position for a full month, and am finally emerging into a better sense of how everything fits together. It is a bit dizzying transitioning from a small campus to big corporate environment, but I set out to learn and have a pretty great team to coach me. I thought the new job might be a good time to freshen up my professional headshot and jumped at the chance to participate in the recent Ivory House Photography buy-one-give-one session benefiting the nonprofit Dress for Success. I’ve written before about my love of personality assessments like the Myers-Briggs (total ENFP in the house!) and recently learned about the Birkman Method, which gives you insights into your needs and usual behaviors, as well as your stress behaviors if your needs aren’t being met. We’re taking it and analyzing our scores as a team, which should be a really great tool for helping us gel and appreciate our differences. I also love that Principal provides financial wellness advice to employees. I went to a lunch and learn that highlighted the 50-20-30 rule, which seems like a much less daunting strategy for spending and saving than some of the other budgeting tools I’ve seen. Getting a better handle on our family finances is one of my personal goals for my mid-30s, so I’m trying to take advantage of work perk type tools. Lastly, a little bit of my writing elsewhere. I had a story about local artists in the March issue of “DSM” magazine (p. 115), and just contributed a little LIFT Iowa piece on why to keep a ‘kudos’ file at work. Something about being cooped up indoors all winter makes my painting elbow itch. Last year, we refreshed our downstairs bathroom and this December I painted giant swatches on our kitchen walls to keep me accountable. I thought we would get everything done while I was home over the holiday, but in reality I think I slept in my bed like 3 of the 12 nights I was off work and that didn’t happen. Instead, we lived with swatches for a month and finally tackled it over MLK weekend while the kids were at home, before hosting a little political house party. We chose Behr Fresh Olive for the walls because I wanted a more toned down green than the Shamrock Surprise (just imagining that’s what it was called!) that has been on the walls since we’ve moved in. My friend Katy has such a cool, relaxed and earthy style so I basically copied her. Can I just say that climbing on counter tops is one of my favorite things? Hoisting myself up on top of the fridge to get to hard-to-reach spots was a weird thrill that made me feel like I was eight years old and breaking all of the rules. Our goal is to swap out our Very Green laminate countertops this year for a white/gray quartz, but we haven’t raided the piggy bank for that yet. I was hoping the walls would cool my intense desire to rip the kitchen out, but now I just want counters more. We added some new art, too! The folks at the Swedish brand Photowall approached me about a blog feature and I was drooling over their made-to-fit wall murals but that wouldn’t work on our mostly textured plaster walls. So we thought a custom canvas would be a cool option for a big blank space over the basement stairs. You can choose from stock images or upload your own art, and I definitely was into personalizing. We did a big (about 4′ x 2.5′) wrapped canvas of an image Joe took when we were on our babymoon in Decorah, Iowa. We got up and watched the sun rise over the prairie at Heritage Valley, where INHF is preserving land and it was magical.Now we get to look at it every time we’re cooking! The Photowall canvas ships super fast via DHL (like, we ordered it Sunday night and got it that Thursday afternoon), but there’s some assembly required. Joe and Eileen teamed up to put it together and he said it was even easier than IKEA furniture. Good news, dear readers! YOU can get 20% off your Photowall.com order using the code BSITMWCampaign2018 at checkout through Feb, 2018. Go forth and re-decorate. Phase 2? We mostly enter the house through the back door, so we’re thinking about trying to DIY a beadboard drop zone with some hooks over where we keep our trash and recycling. We’ll see if we get to that and the counters done when summer hits (plus swap out our hardware for something darker), so we can grill out while our kitchen is crazy and be ready for life with a Kindergartener this fall! Disclosure: The team at Photowall provided me with the canvas. Views are my own! I’m halfway through my holiday break and am wondering if staying at home while sending my kids to daycare is an option for like, ever. I mean, I love working, but I might love baking banana bread in my pajamas while watching Netflix slightly more right now. I finished “Sing, Unburied, Sing” and “History of Wolves” from my holiday book stack. Neither is particularly uplifting (understatement) but both are beautifully written. And, they’re short so I knocked out 20+ books this year! I’m flipping through David Sedaris’ “Theft by Finding” and it’s fun. He’s a great example of someone whose 20s were a hot mess, but now he’s an internationally celebrated author. They’re all edited diary entries from 1977-2002. I recently came across some of my old diaries from my early 20s, and I’ve been thinking about starting an analog one up again. It’s fascinating to hop back to what was consuming my mind back then, and I have the worst memory, so it helped me recall that time period. I feel like I’m in such a fun phase of life right now, and I’ve just mostly been storing things on this blog for the past seven years. I haven’t had a show of my own (one I don’t watch with Joe) in forever and have hardly watched any TV in the past several months. So when I read about Alias Grace, a Netflix miniseries based on a Margaret Atwood novel, I was intrigued. If you love period dramas (costumes! ), feminism, and aren’t super squeamish (it’s not appropriate for kids at all), this is your next bingewatch! Joe and I are also digging into Season II of The Crown. My goal was to clean the basement while I was off, but instead I got out my sewing machine for the first time in forever to make a Christmas gift, and whipped up a few of these slobber monkey pattern bibs and caught up on podcasts while I was at it. It’s such a fun and satisfying little project, and you can get two out of two fat quarters. I’ve had gray hairs since college, and a few years ago decided to start dying on the regular. (I wish I could be one of those confident gray-at-30 ladies, but it’s not for me!) If I stay on top of things, I would be dying it every five or six weeks, which is not sustainable at salon prices/my budget. I was using drugstore box color, but it felt really one-dimensional. I started using Madison Reed for mail-order color, and I’m totally in love. All of you Okoboji people already knew about this place, but I had my first Spudnutz donuts when we were up there for a wedding over Christmas and they were life-changing. I got a sample donut hole while waiting in line and increased my order from 20 holes to 30 and then got two big donuts, too, because I couldn’t believe my mouth. It was excessive, but we drove around and looked at the frozen lake houses and ate them and then they came in handy the next morning as a hangover cure. So. Good. It seems like a lot of work to attempt to make them at home. I hope everyone is having a safe and cozy holiday! I feel so fortunate to have this time off to rest and reset!